Tiny House Made of Mushrooms is Now Complete! A short while ago, Inhabitat brought you news that New York's first house made of mushrooms was being grown in Green Island by Ecovative, and now the funky fungus abode is complete. The material science company built the frame of their "Mushroom Tiny House" out of wood but filled it with a material made of mushrooms, making it one of the first mycelium-based abodes in the world! The Mushroom Tiny House isn’t a behemoth. With a footprint of 12′ x 7′, it’s more of an Enoki than a full-grown Portabello. But what the home lacks in size, it makes up for with its impressive use of green materials. Unlike traditional houses, which are often lined with petroleum-based foam insulation, the wooden walls of the Mushroom Tiny House are lined with mycelium (or mushroom “roots”). This mushroom insulation forms an airtight seal and excellent thermal protection. According to Ecovative, it is also affordable, fire resistant and has low or no VOCs. In addition to naturally-grown insulation, the house also has ceiling tiles made of mushroom material. “At its core, our vision in the building industry is to offer architects, builders and consumers the ultimate solution for eco-friendly, energy-efficient construction at a price that is far less costly to our health, the environment and our pocketbooks,” said Ecovative Co-Founder Eben Bayer. 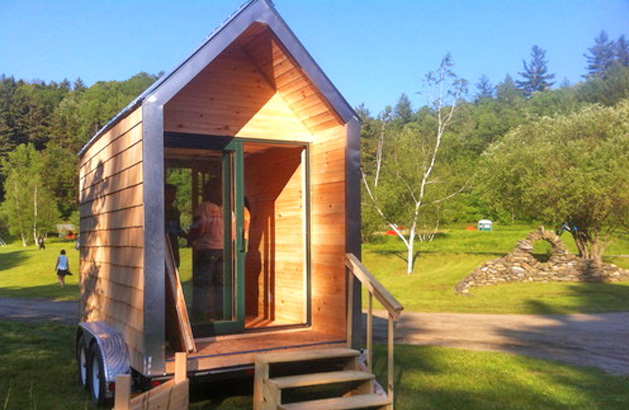 After the home was completed in mid-June, Ecovative‘s mushroom house was transported by trailer from Green Island, New York to Vermont for the 2013 Tiny House Fair. Would it not be easier to construct sips panel for tiny house construction? AFAIK and from what I've seen in their Ecovative website... The fungus material and the fungus food are mixed together and allowed to start the eating process. Once the material has turned clay like then it is inserted between the cavity walls and allowed to finish until all fungus food material is consumed and mushroom solidifies. Is the mycelium alive upon its placement inside the structure? As in is it allowed to grow into the structural wood framing or is dried mycelium just being placed into the cavities of the wall? If dried - would it not be better to allow it to fuse to the side walls while alive? If alive - are there concerns about infections to the mycelium? Also myceluim has a tendency to grow on the outer limits of the substrate and avoid progressing into the inner core is this a concern? Is that a wood substrate or just grain spawn? This is a great use of your Ecovative technology. Congrats and gave fun at the Rimy House Fair! The Mushroom Tiny House isn't a behemoth. With a footprint of 12′ x 7′, it's more of an Enoki than a full-grown Portabello. But what the home lacks in size, it makes up for with its impressive use of green materials. Unlike traditional houses, which are often lined with petroleum-based foam insulation, the wooden walls of the Mushroom Tiny House are lined with mycelium (or mushroom “roots”). This mushroom insulation forms an airtight seal and excellent thermal protection. According to Ecovative, it is also affordable, fire resistant and has low or no VOCs. In addition to naturally-grown insulation, the house also has ceiling tiles made of mushroom material. The completed mushroom house traveled to Vermont and back to New York for Yestermorrow's Tiny House Fair. According to Green Island, NY-based Ecovative, your favorite fungus might also be the building material of the future. Already known for its award-winning mycelium packaging, which protects the wares of clients like Dell and Crate & Barrel during shipping, Ecovative hopes to take their business to the next level by showing what else can be done using 'shrooms. The Mushroom Tiny House won't be a behemoth. With a footprint of 12′ x 7′, it will be more of an Enoki than a full-grown Portabello. Still, what the home lacks in size, it will make up for with its impressive use of green materials. Unlike traditional houses, which are often lined with petroleum-based foam insulation during construction, the walls of the Mushroom Tiny House are made of mycelium (or mushroom “roots”) that is literally being grown into wooden walls. Once it's done growing, this mushroom insulation will continue to dry over the course of a month forming an airtight seal and excellent thermal protection. According to Ecovative, it will also be affordable, fire resistant and will have low or no VOCs. In addition to naturally-grown insulation, the house will also have ceiling tiles made of mushroom material. “At its core, our vision in the building industry is to offer architects, builders and consumers the ultimate solution for eco-friendly, energy-efficient construction at a price that is far less costly to our health, the environment and our pocketbooks,” said Ecovative Co-Founder Eben Bayer. Ecovative's mushroom house is expected to be complete by mid-June, after which it will be transported by trailer from Green Island, New York to Vermont for the 2013 Tiny House Fair. And, since we had to ask, will the Mushroom Tiny House's insulation be edible? "It’s like eating cardboard," said Ecovative rep Melanie Frenkel. "You can eat it, but they don’t recommend it. It’s not good."